I find it a bit ironic that it is National Poetry Month 2015 and these dry bones are not giving up much poetry. Or prose or words of any genre. Nice timing, right? That it is Springtime and nearly everything around me here in the South is green or pink or fuschia and lime. New birth, earthy moist and hopeful surrounds me. Lifts my spirits high and yet paradoxically seems to mock my writing life. It is not in sync with the world. My words sit at the bottom of a dry well. As a writer, inspiration can come from the seemingly strangest of places. Truly. This is a bit confessional and a lot inspirational for others who find themselves in a dry place creatively. 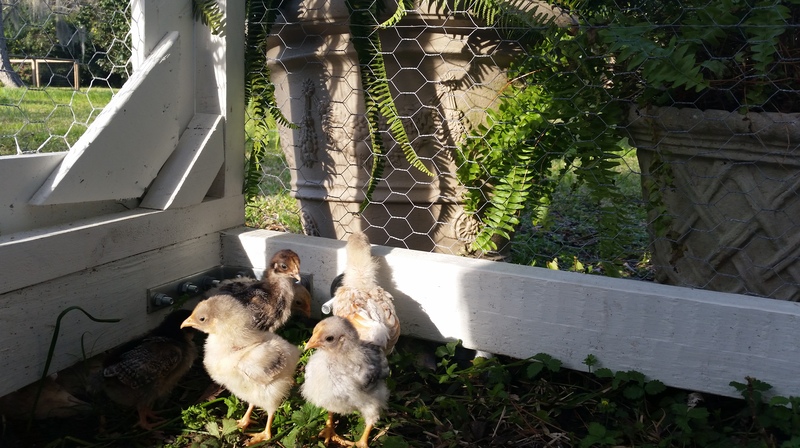 So yes, I have been tending to six baby chickens. Loving them, naming them and studying them. Trying to figure out all their hunting and pecking strategies or randomness and simply why they do what they do. It is like a mini Anthropology course but not so much because they are, duh, chickens. And so this won’t be the longest introduction ever to a poetry blog post, I will move on. Move forward with this poetry segway. Or segway into a poem which breaks the silence. I just hung up from Voxering a bit ago with my friend in London, Shelly Miller. I whined about, slash confessed, my lack of writing inspiration. Is Voxering a verb? And then I promptly promised someone in Europe that I would make myself write today. What happened to passion and for the love of the craft and “I can’t not write?” Shelly and I lamented and then if that wasn’t enough I Voxered my friend Sandra Heska King in Michigan to whine some more. Some days require bicontinental consolation. And after all the whining I realized all the inspiration I needed for today was found in studying my chickens hunting and pecking and scratching. They work with what they have. If they can do it I can too. And gazing at my old yellow lab who may live another week if we are lucky. She wanders around in search of joy. I believe I’ve got this. If my old girl can find joy in her slow and lethargic wanderings. Well, this writer can too. And my friends, who are writers and artists, whispering just the write things at just the right time into my life as a creative. That feeds my soul. I am grateful for the fur, the feathers and the friends. And for how they fuel my passion for writing. Light a match to the fading embers. Move me from thinking of writing, to actually writing again. And the poet who barred the door shut? Joining Tweetspeak Poetry using a one line prompt from today’s Everyday Poetry poem “Where Childhood Went’ by Kim Addonizio. Next ›Do You Know This Goodbye? Elizabeth – I LOVED this. I loved the poem, I loved the confession, I loved that you turned to other writers in times like these. That’s why we need each other. To remind each other of these times and to encourage one another to keep on going. Oh my gosh! You found words. Or they found you, and you let them in. You’ve inspired me today and made me miss our chicks, and I don’t want my words to check into a retirement home before I do. Or even then. I love everything about your words here. I loved voxing/voxering with you. I love that we can connect words and hearts in so many ways. And I just plain love you. So there’s that! . . I'm going on an adventure. Away from right here for a few weeks. I'm taking a sabbatical from social media for Lent. Taking time to restore and reflect and listen closely to God. A project is asking for my full attention, so I'll also be at my writing desk praying through the pages there. ○ Please feel free to follow along on my blog where I'll be writing a bit more regularly. Or listen in to my podcast which I will be producing weekly. And you may email me as I'll be check in there. Peace and grace to each of you dear friends. I'm so grateful for each one of you. So very grateful for your presence here.